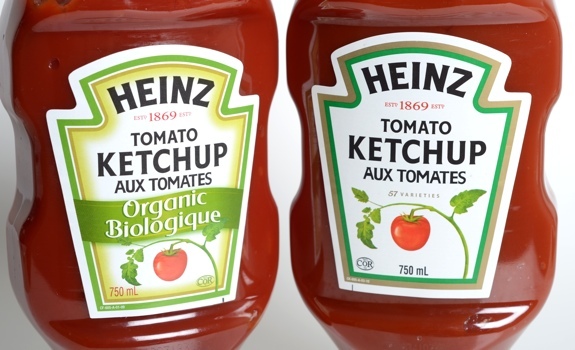 Heinz Organic Tomato Ketchup vs. Heinz Tomato Ketchup: It's nice to have a choice, isn't it? Next Monday, May 23rd, marks the unofficial start of summer in Canada. It’s the May long weekend, celebrating both Victoria Day and the start of BBQ season. And what key condiment is crucial to a summer BBQ of burgers and hot dogs? Why ketchup, of course. Cost: I paid $3.50 for the 750 ml bottle of regular ketchup, and $6.49 for the same sized bottle of organic ketchup. That’s a pretty huge difference. Availability: How widespread is the availability of regular Heinz Ketchup? I had no trouble finding it a decade ago at a supermarket in Ouagadougou, Burkina Faso. In Canada, every grocery store, convenience store and dépanneur carries it. The organic variety isn’t anywhere near as easy to find, though I see it more and more these days. Taste: I tried both of these side-by-side with some fries. Not surprisingly, the taste is pretty much identical. The Heinz Tomato Ketchup formula is a proven hit, so why mess with a good thing? I’d be upset it they tasted different. Ingredients: The tomato paste isn’t the only organic thing in Heinz Organic Tomato Ketchup. Everything else on the ingredients list, aside from “salt” and “spices,” has the word “organic” in front of it. Intangibles: This is the part of the review where I get to justify spending twice as much for the same thing because it’s organic. Here goes … I don’t care that it doesn’t taste any better, nor to I care about whether or not it’s better for me. The reason I buy organics when I can is because of the effect that intensive chemical-driven agriculture has on the land. Adding pesticides and herbicides to land may make a lot of economic sense, but sometimes I like to think beyond economic sense. The verdict: On taste, no difference. But if it’s available, I’ll usually pick the organic one. It’s just as good, and I like supporting companies – even huge ones – willing to take the plunge into organics. I have been using the regular Heinz for 60years and like it.I like the taste of the organic much better and have stockpiled it in case I can not get it.I have diverticulitus and the organic is better on my inards.I like to buy it in the largest bottles I can find. Thanks ,Charlie.